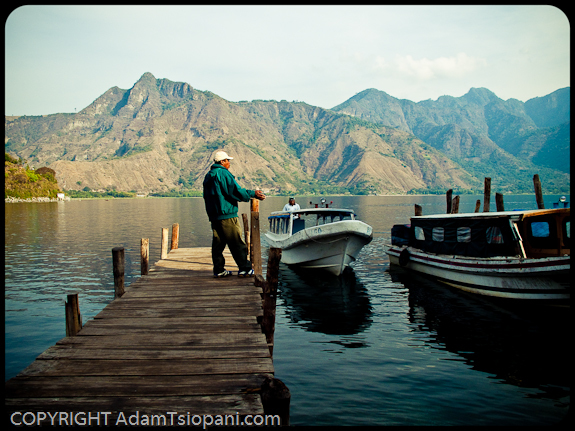 The town of San Pedro rests on the edge of Lake Atitlan; Guatemala’s largest lake. Eight other towns each enjoy a spot on the lake’s perimeter and from here we can see three of them. At night, their lights Iook like points on a Hollywood movie mission control panel from the Starship Enterprise. I find myself imagining that each of those lights pairs with one of the multitude of crickets I hear chirping through the darkness. We are very high in altitude. Volcanic mountains surround us and dominate the views. A collection of four bumps on one of these congregate together, forming the perfect silhouetted elevation of a Mayan face. It is a strikingly powerful vista. Black bass and perch inhabit the lake. The bass were introduced by American Airlines in the seventies, who promised the locals it would boost tourism with an influx of wealthy American sport fishermen. Unfortunately, they wiped out two other smaller indigenous fish from the lake causing the total extinction of an aquatic bird that was unique to this lake and whose diet consisted solely of those fish. Still, they make delicious eating! (The bass, that is). Today I hired a kayak – $2 for three hours – and explored some of the lake and its shores. I brought with me a telescopic fishing rod, with rubber lure, to try my luck for the bass. The lake goes to about four metres depth within thirty meters of its shoreline and then plummets three hundred meters deep. It is in fact a huge and ancient crater, an imploded volcano, now as extinct as the Mayans who once roamed here. This presented me with an angling conundrum, as my tackle and bait were not suitable for the small perch in the shallows nor was my line long enough to tempt the bass in the abyss. After three hours and minor sunburn, I packed in the towel!